CEDAR CITY, Iowa (AP) — Easton Stick had two scoring runs and a touchdown pass and North Dakota State scored 28 unanswered points in the fourth quarter to turn a close game into a rout with a 56-31 thumping of Northern Iowa in Missouri Valley Football Conference play on Saturday. The Bison (5-0, 2-0), the top-ranked FCS team in the coaches’ poll, trailed the 22nd-ranked Panthers (2-3, 1-1) by three points entering the fourth quarter. That’s when Stick took over the game. NDSU’s senior quarterback started the scoring burst with a 75-yard strike to Bruce Anderson on the first play of a drive just 11 seconds into the fourth quarter for a 35-31 lead. 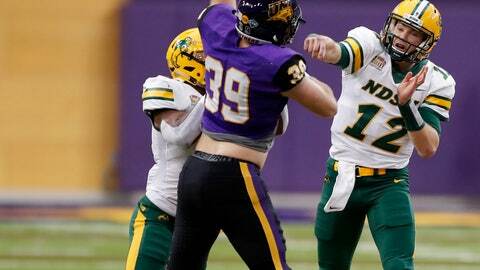 Stick added a 1-yard TD plunge and a 31-yard TD run on the Bison’s next two possessions. Adam Cofield added a 25-yard TD run to cap the scoring as NDSU finished with TDs on all four fourth-quarter possessions. Stick completed just nine passes for 179 yards, but four of them went for TDs. He added 35 yards rushing. Eli Dunne passed for 362 yards and three TDs for the Panthers.